John Deere’s new CommandPRO joystick has won the Farmers Guide Award for Excellence for 2016, the second year that these awards have been presented for innovations in the machinery and arable sectors. The awards were set up in memory of Doug Potts, who founded the original East Anglian Farmers Guide magazine in 1979. They are intended to highlight excellence within the industry, as selected by Farmers Guide machinery editor David Williams and arable editor Dominic Kilburn. 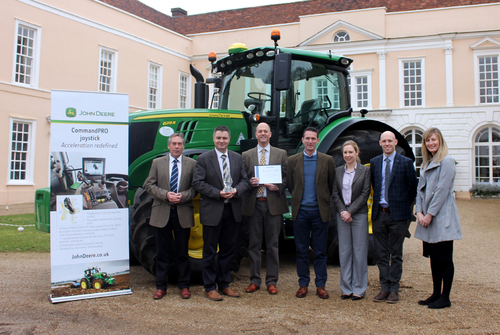 John Deere Limited marketing manager Chris Wiltshire received the 2016 machinery trophy and award certificate at a presentation held in February at Hintlesham Hall near Ipswich. This was also attended by local John Deere dealers Paul Tuckwell of P Tuckwell Ltd, Alex Child and Zoe Spencer of the Doubleday Group, and David Fairman and Hollie Cruickshank of Ben Burgess. Crop protection business Syngenta UK won the arable award for its new cereal fungicide Elatus Era. The all-new CommandPRO joystick option was announced in autumn 2016 at the launch of the new 6230R and 6250R tractors, and introduces a new dimension in ergonomics and versatility to the John Deere range. Top speed can be reached with just one push, and 11 programmable buttons are available for the hitch, pto, SCVs, AutoTrac steering controls etc. The functionality of CommandPRO allows the tractor to be controlled from top speed to zero with a simple push or pull of the joystick, and lower speeds from 0 to 2kph can be achieved with the creeper control function. Both the joystick and conventional tractor pedals can be operated at the same time, and there is no need for an external ISOBUS joystick as the driver can also operate the tractor and ISOBUS functions simultaneously. Speaking at the award presentations, David Williams said: “The Farmers Guide Awards for Excellence are our way of identifying and celebrating the best innovations of the year, and rewarding the work that goes into them and the people responsible. “John Deere’s CommandPRO joystick is an important development for the company, and is going to be used all year round by demanding farmers and contractors. There are some very interesting new functions on this joystick that I believe will make a big difference to operators, both in the field and on the road.